The cashmere dressing gown is the very height of luxury; a garment that is both beautiful, supremely soft and exquisitely comfortable. Cut by hand by our master pattern cutter who has worked at Derek Rose for over 30 years and then hand-sewn and piped by our skilled seamstresses, the Duke is entirely made in our workshop in Cheshire, England. The Duke boasts a herringbone stripe in the finest, navy worsted spun cashmere, woven by Loro Piana of Italy and is fully lined in the softest of pure Italian silks. 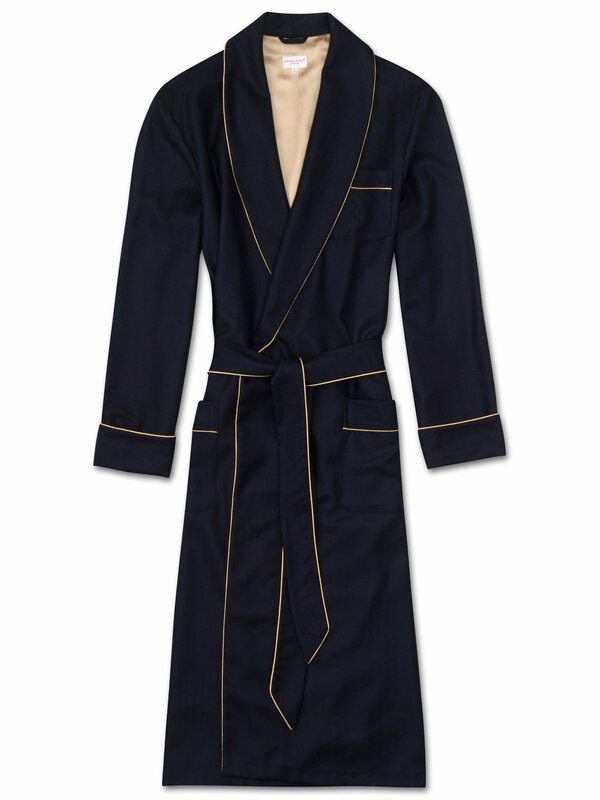 We have sourced the very best in materials and utilised our most skilled hands to make the Duke one of the most iconic items of luxury nightwear a man can own. As the Duke is made to order, please allow 2 - 4 weeks from the date you place your order for the gown to be made.